Unlike a baby’s ears, which are almost fully developed when a baby is born, a baby’s eyes and vision are not. As a baby grows through their first year, so do their eyes and their ability to see. This in turn stimulates the connection between the eye and the brain and usually leads to normal vision. Visual development is most dramatic between 6 and 12 months of age and is critical for a child’s normal overall development. Although most babies will develop normally if left alone, early detection and treatment of potential eye and vision problems can be key in setting the baby on the right track for development later in life. Risk factors for many eye conditions have no signs or symptoms and it’s estimated that one in 10 children is at risk for an undiagnosed eye or vision problem. If these problems are left untreated, they can lead to difficulties in development, school, and potential permanent vision loss. Amblyopia (lazy eye) affects 2.5 to 4.5 percent of the population while strabismus (crossed eyes) affects 4 to 6 percent. Vision development and eye health problems can be more easily corrected if treatment is begun early. However, a survey done by BabyCenter.com reveals that nearly half of mothers mistakenly believe that it is best to wait until a child is older to get them screened by an eyecare professional. And only 13 percent of parents make sure their children receive a comprehensive eye assessment in their first two years. As parents, we know to take our children to the dentist to help prevent cavities. 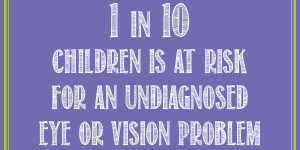 We should also be taking our children to the eye doctor to help prevent potential eye and vision problems. Here, an eye and vision examination is performed, in addition to the eye screening performed in a pediatric well visit, and offers a comprehensive evaluation and early detection of potential eye and vision problems. Although a baby can be seen as soon as it is born, the assessment is usually done on infants 6 to 12 months old. Even though an infant cannot speak, a full assessment of their vision, excessive or unequal amounts of nearsightedness, farsightedness, or astigmatism, eye teaming, eye tracking, eye focusing, and overall eye health can be conducted. The doctor will be looking closely for things such as conjunctivitis (pink eye), dacryostenosis (blocked tear duct), retinoblastoma (eye cancer), retinopathy of prematurity, amblyopia (lazy eye), strabismus (crossed eyes), cataracts, glaucoma, retinal disorders, optic nerve disorders, and other congenital eye problems. Typically, the infant will sit on the parent’s lap during the assessment and the doctor will use lights and toys to check that the eyes are working properly both individually and together. The doctor may also use drops or a spray to dilate the baby’s pupils to ensure the health of the eyes. If everything is found to be healthy, the doctor will instruct you on when to bring the child in for future visits. Usually, if findings are normal, a baby will be seen every two years and then yearly once they start school. When you come for the appointment, make sure that the baby is not sick, is well fed, changed, has had a normal nights sleep, and is not getting ready for another nap during the time of the appointment. You can also bring one or two of their favorite toys to use as distractors or part of the exam. A baby’s health and family history are very important. Factors that may indicate a baby is at risk for visual impairment are listed below. Babies who meet these criteria should be evaluated by an eye doctor in their first year of life. Developmental delay, Down’s syndrome, cerebral palsy, spina bifida, autism spectrum disorder. The baby should also be seen immediately if the parent notes the presence of a white pupil (normally the black round part of the front of the eye), extreme sensitivity to light, a bulging eye, red and encrusted eyelids, or a constant eye turn or excessive tearing past 3 months of age. During this assessment, the doctor will work to identify critical eye and vision problems at an early stage, explain those conditions to the parents, and provide the care or referral necessary to correct those problems. Proper prenatal care, including regular follow up with your OBGYN, rest, proper nutrition and taking prenatal vitamins are very important to the development of healthy eyes and the related nervous system. Avoid smoking, alcohol or drugs during pregnancy, as this can cause multiple problems for your baby. The eyes are examined for signs of congenital eye problems. An antibiotic ointment will typically be administered to prevent infection. Within a short period of time he/she will focus on objects less than a foot away, such as mom’s face when nursing. Large, complex shapes and high contrast targets best stimulate the infant’s interest. At birth the baby sees in black and white and shades of gray. At about one week they are able to see red, orange, yellow and green. Blue and violet takes a little longer. The baby prefers looking at their mother’s face than that of a stranger. Keeping your appearance consistent will help the baby recognize you. It is normal for the eyes to not always track together for the first 8 weeks. This should only be a concern if the eyes are never aligned or their alignment does not gradually improve. The tear drainage ducts may not be fully open so tearing may be normal. They usually open on their own, but the doctor should be informed of any excess tearing. The baby is learning to shift his/her gaze from one object to another with minimal head movement. The baby is learning to sluggishly follow a slow moving object within its line of sight. Stimulate both sides of the baby’s body. Hang a brightly colored mobile with large contrasting targets above the crib. Introduce tummy time (with constant supervision and never when they are sleeping). Use a nightlight or dim lamp in the baby’s room so they can look around if they wake at night. Baby should begin to follow (track) moving objects and reach for things. It starts as very inconsistent and becomes more accurate as eye-hand coordination and depth perception (3D vision) begin to develop. The baby is focused on things about 8-12 inches away, keep reach and touch toys within your baby’s focus. Add new items to their visual surroundings frequently. Change the cribs position and your child’s position in it so they get different perspectives of the room. Talk with your baby as you walk around and look at different objects. Give the baby plenty of time to explore. Visual acuity improves from about 20/400-20/800 at birth to approximately 20/25 at 6 months of age. Baby’s eye teaming, tracking and focusing are improving and they are paying more attention to distant objects. The tear drainage ducts should be open. Color vision is improved, but not perfect. Let baby explore different shapes and textures. Give baby freedom to crawl and explore. Play peek-a-boo with baby. Eye-hand coordination improves so they are able to quickly locate and pick up objects and accurately direct them to their mouth. Baby should visit an optometrist their first comprehensive eye and vision examination. The baby’s eye teaming, tracking, and focusing are close to adult like. The baby is learning to crawl, is better at judging distances and more accurate at grasping and throwing objects. They are learning how to coordinate their vision with body movement. Give your baby stacking and take apart toys and toys they can hold and manipulate. Place a toy out of their reach and encourage them to crawl and grab it.